Like so many people drawn to coastal Maine for vacation, Rachel Carson loved to go tidepooling. But for Carson, scooping up buckets full of the tiny creatures found along the Maine coast at low tide was not just an idle pursuit. It was part of her life’s work, including research and writing that today is credited with igniting the modern environmental movement. WHAT: New documentary about the pioneering environmentalist who spent summers and did research at a cottage in Southport, near Boothbay. WHERE: “American Experience” on PBS stations, including the stations of Maine Public Television. WHAT ELSE: Maine Public Television has scheduled several additional airings, including 2 p.m. Saturday on its World channel and 1 p.m. Jan. 29. For a new documentary film on Carson, which premieres at 8 p.m. Tuesday on the PBS series “American Experience,” producer and director Michelle Ferrari filmed and did research at Carson’s Southport cottage, which is still owned by her family. Carson used her tidepooling there as the research for her 1955 book “The Edge of the Sea.” Her 1962 book “Silent Spring” warned of the dangers of pesticides and caused a national sensation. She died in 1964 at the age of 56, of cancer. Carson was born on a farm in Springdale, Pennsylvania, near Pittsburgh. She earned a master’s degree in zoology from Johns Hopkins University in Maryland. But she didn’t finish her doctoral studies at Johns Hopkins because of family financial problems. Instead she went to work as an information specialist for the U.S. Fish and Wildlife Service, in the late 1930s. She began writing essays for magazines and publications soon after, and by the early 1950s was working full-time as a nature writer. Rachel Carson on her porch in Southport in 1955. She moved, with her mother, to Southport in 1953 to a cottage she called Silverledges. 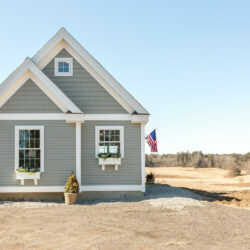 The cottage is on a hill above Sheepscot Bay, with a steep path down to a rocky shore, tide pools and a small sandy beach. While writing “The Edge of the Sea,” she would collect kelp, sea colander, dogwinkles, periwinkles, mussels and many other life forms in buckets, then bring them up to her cottage to study them under a microscope, Ferrari said. The two-hour film features actress Mary-Louise Parker speaking as Carson. The film includes interviews with writers, academics, family friends and Carson’s adopted son, Roger Christie. Carson took Christie in when he was 5, after his mother, Carson’s niece, died suddenly in the late 1950s. The filmmakers spent about two weeks at Carson’s cottage, owned by Christie. By the late 1950s Carson’s research files were full of reports on the destructive effects of chemicals on fish, birds and other wildlife. Such information wasn’t widely known, believed or shared then, and Carson made it her mission to warn the public. She channeled her efforts into her 1962 book “Silent Spring,” which was an instant best-seller, and sparked dramatic changes in government regulation of pesticides. The book is widely regarded as the spark that started the modern environmental movement, and it had a very personal impact on millions of people. 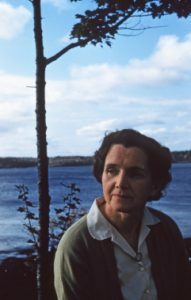 In Maine, her memory is honored by the 5,300-acre Rachel Carson National Wildlife Refuge, which spans about 50 miles of coastline from Kittery to Cape Elizabeth. She said working on a film about Rachel Carson seemed especially relevant right now because of the “ongoing tension” in society over how to balance economic and technical progress with the preservation of the natural world.